Theresa May and EU Commission President Jean-Claude Juncker have agreed to "accelerate" Brexit negotiations - but there was no sign of a breakthrough after their working dinner. 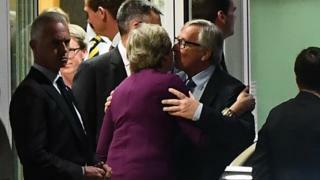 A joint statement said the Brussels talks - which came before EU member states meet to assess progress - were "constructive and friendly". The UK's financial settlement with the EU continues to be a sticking point. The EU will not discuss trade until this has been settled. Reality Check: Does the UK owe the EU money? Mrs May has also spoken to the French and German leaders ahead of the European Council summit. The EU's chief negotiator Michel Barnier and his UK opposite number, Brexit Secretary David Davis, also joined the working dinner. "The prime minister and the president of the European Commission reviewed the progress made in the Article 50 negotiations so far and agreed that these efforts should accelerate over the months to come," the statement read. "The working dinner took place in a constructive and friendly atmosphere." OK, in theory, if I am driving a car at four miles per hour and I speed up to eight miles per hour, technically I am accelerating. I may still be basically crawling along. I still may be late - very, very late - for my eventual destination. But, by the very action of pressing the pedal and going faster, I am actually speeding up. If anyone accuses me of going nowhere, or slowing down - well, look at my speedometer. I am going faster and I have evidence that you are wrong! That is why, in the next few days, don't be surprised if every Tory politician you see, hear, or read about is using that word (at least those loyal to the government) to claim that there is progress in the Brexit talks, just days after the chief negotiator on the EU side declared a deadlock. Read more of Laura Kuenssberg's blog here. BBC Europe correspondent Kevin Connolly said the joint statement released after the dinner was "a masterpiece of uncommunicative communication". He said: "It recorded formally that Brexit negotiations are taking place between the EU 27 and the UK - a statement of the obvious that may hint at Brussels' displeasure with British attempts to talk directly to individual member states as well." He added: "The gnomic communique was perhaps an attempt to avoid a repeat of the fallout from the last bilateral dinner in Downing Street in April after which the EU side was reported to have described the British as 'delusional' and even disparaged the food." Along with the UK's "divorce bill", the EU is insisting agreement be reached on citizens' rights and what happens on the Northern Irish border before agreeing to open talks on the free trade deal Mrs May's government wants to strike. Last week an internal draft document suggested the EU was going to begin preparing for the possibility of trade talks beginning in December - provided the UK does more to bridge the gap on these key negotiating points. Speaking on BBC Radio 4's Today programme, Michael Fuchs, the vice chairman of Angela Merkels's Christian Democratic Union party, agreed it was "absolutely necessary" to accelerate the talks, given the two-year timeframe for departure set out by the EU treaties. But he suggested Foreign Secretary Boris Johnson was thwarting Mrs May's attempts to reach a deal on the financial issue. "I know there are internal problems, whatever she is offering, Boris Johnson is saying it's too much," he said. "I don't know what his influence (is), it seems to be pretty strong because otherwise she would come up with other proposals I guess and the problem is she has internal trouble in the Tories." Speaking in the House of Commons, Mr Johnson said he thought a reported bill of £100bn was too high, accusing Labour of being willing to "cough up" such a sum. He said the government was united on its Brexit strategy and urged the EU to "get serious" and agree to settle the citizens' rights question. Meanwhile, a new report suggests that leaving the EU without a trade deal would lead to a significant rise in living costs for millions of people. Research by the Resolution Foundation and trade experts at Sussex University calculates that the average household would pay an extra £260 a year for imported goods. For three million households - those who consume the most imported goods - that figure would nearly double to £500 a year. The report says that without a Brexit deal, European goods would incur the same tariffs as those imposed on other World Trade Organisation countries, increasing levies on dairy products by 45% and meat products by 37%. 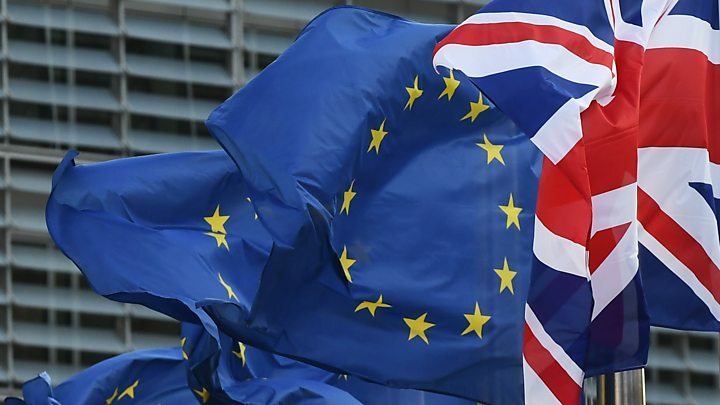 But a government spokesperson said ministers were optimistic about achieving an agreement with the EU that would allow for frictionless trade in goods and services.